Before commencing this review I feel duty bound to impart a personal opinion and that is that the jug ranks alongside the kazoo as the least attractive instrument ever to be introduced to American Folk Music. Incapable of musical dexterity, unlike the equally dubious Jews harp, Swanee whistle or musical saw, and devoid of any soulful expression, it can surely be viewed as no more than a visual novelty instrument. That said, when these recordings were made in the Twenties and Thirties they themselves were a novelty and if some of the glorious music that they contain was deemed to require a jug to be blown to make it commercially viable, then who am I to complain? For indeed, amongst all the grunts, rasps and burps here, on these two CDs is as fine a collection of downhome blues, rural jazz and country dance music available today. A novelty it may have been, but novelties a century ago obviously had a longer shelf life than today, for jug bands had been around for at least two decades when the Dixieland Jug Blowers from Louisville, Kentucky made their recording debut in1924 and committed the music to wax for the first time. Lead by Earl MacDonald (jug) and violinist Clifford Hayes, their music combined sophisticated Dixieland Jazz (clarinetist Johnny Dodds appears on one of their tracks), and catchy pop, but often with one eye on an older minstrel tradition as on Casey Bill and the brilliantly performed She's in the Graveyard Now (sound clip). 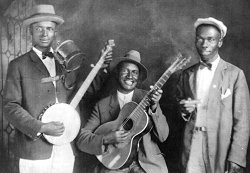 They were literally a sensation, and while rural musicians are often credited with being the inspiration for popular musics, the reverse occurred as frequently and two less urbane jug bands from Louiville - The Kentucky and Whistlers - quickly jumped on the bandwagon and are featured here. The former's sole offering is enhanced by a very fine cane fife player, while Whistlers' material ranges from deep blues to the bizarre Vamps of 98. However, barring an unlikely renaissance, it will be the field of country blues that stores the music's finest legacy. Wanting to form a band "something like the boys in Louisville", guitarist Will Shade assembled the Memphis Jug Band, who first recorded in 1927 and whose volume of recorded output, variety of marerial and musical excellence could only really be matched by the string band The Mississippi Sheiks in the Deep South of the day. The whole range is here - minstrelsy (compare their rustic Jailhouse Now to Clifford Hayes'), pop, You May Leave but this Will Bring You Back, hokum and the deep blues that accompany vocalists Hattie Hart and the haunting Minnie Wallace. This the the epitome of the Jug Band Sound (sound clip). Yazoo have been championing these musics for many years now but their leading card has always been Country Blues, so it is no surprise that three quarters of the selections favour this idiom. Fabulous tracks by other Memphis groups lead by Jack Kelly and Jed Davenport are only just eclipsed by the outstanding Cincinattis and the ferocious anonymous singer who fronts the Birmingham Jug Band (sound clip). However, in this field there can only ever be one winner. It has occurred to me before, but could it be the J-word that prompts writers to exclude Cannon's Jug Stompers from the oft recited roll call of all time Delta Greats. For surely with Cannon's dextrous banjo, Ashley Thompson's shimmering vocal and snapped basses, and the unsurpassed harmonica playing of Noah Lewis, this is Mississippi Blues at its peak (sound clip). In complete constrast but I guess for completeness' sake four tracks by white groups are included. The Five Harmaniacs (of whom there were naturally four) are spirited, while Ezra Buzzington's Rustic Revellers are clever. Clever yes, but any group that features not only the jug but the dreaded Swanee whistle and 'novelty laughing', has a mountain to climb as far as I'm concerned, and it comes as no surprise to me that they were an early incarnation of the equally annoying Hoosier Hot Shots. On the other hand, no amount of unnecessary kitchenware can detract from the work of The Prairie Ramblers, surely the greatest country swing band ever to record. The ultimate sore thumb in this company, though, is The Walter Family from Kentucky, here performing their classic That's my rabbit, my dog caught it. A simple but memorable fiddle tune is augmented, first by piano, then banjo, then jug. They stop and then repeat the process. Wonderful. Good stuff then. (You can safely ignore my few jaundiced comments and purchase with confidence.) But if you are still waivering, I could just add that one of the finest recordings of all time, in any genre and by any performer, happens to sit on Volume One. 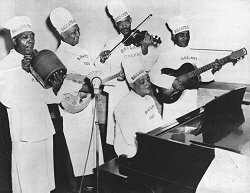 Belying the human misery it depicts, Hattie Hart's jaunty reading of Cocaine Habit Blues (sound clip) should be compulsorily played to every aspiring gangsta rapper just to prove, as fellow Memphis Jug Band diva, Minnie Wallace, proclaims elsewhere - the old folks started it!